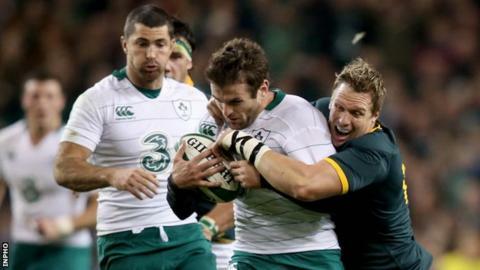 Jared Payne could miss Ireland's Test against Georgia next weekend after suffering a suspected foot sprain in the 29-15 win over South Africa. Debutant Payne forged an effective defensive centre pairing with Robbie Henshaw as Ireland claimed their fifth consecutive victory on Saturday. Former New Zealand Under-21 star Payne will undergo further tests on Monday. "Just chatting to Jared and the doc, we think he might have sprained his foot," said Ireland coach Joe Schmidt. "He's had an X-ray that's clear so it's a step in the right direction, not that he's probably taking too many rampant strides at the moment. "I'm hopeful that it will be okay, but we won't know until probably Monday evening or Tuesday because I think there's some scans booked for Monday." Payne hobbled off in the closing stages of Ireland's win but Schmidt was delighted by the contribution of the Kiwi native and Connacht's Robbie Henshaw as they formed a new centre partnership in the post-Brian O'Driscoll era. "We'll review the game, but coming cold in reflection I thought they both did incredibly well. "There was some really physical defence from both players," added Schmidt.